Visiting India is incomplete if one does not choose to go and watch Taj Mahal. Smitten by the grace and charm of his Begum Mumtaz Mahal, Emperor Shah Jahan had built this love mausoleum in her remembrance. He was so much in love with his queen that he did not bother to invest his patience on its construction that took 20 long years. He had appointed the best architects and formed a board that employed artisans, number ranging to 20,000 men. They consisted of labourers, painters, embroidery artists and stonecutters. He used best and unique quality raw materials which were brought from different parts of the country and world. Translucent white marble was brought from Makrana, Rajasthan, jasper from Punjab, jade and crystal from China. The turquoise was brought from Tibet and the lapis lazuli from Afghanistan. The sapphire was brought from Sri Lanka and the carnelian from Arabia. With such a masterpiece, the emperor has nailed its name in one of the 7 wonders of the world by the UNESCO. River Yamuna flowing beside this love mausoleum adds charm to its everlasting beauty. The true love of the Sheshansh for his Begam has crossed borders to attract millions of visitors from around the world every year. The Taj does not consider only the Mahal. The brilliant piece is surrounded by amazing places that one should not miss to see and explore. If you are an outsider, hiring a Taj Mahal tour guide will be of greatest help. They have a huge stock of unknown facts and rumors encircled with the mausoleum. These titbits are very interesting and gives you an idea of the then Indian lifestyle and culture of the country. ●Agra Fort - UNESCO has credited Agra Fort as a World Heritage Site. The fort was the residence of the then Mughal emperors. Since it is located only 2.5 km away from Taj Mahal, one can get a nice view of the love mausoleum from the fort. The red sandstone fort is more likely a walled city. There are lots of fascinating things inside that you will love to watch. There are mesmerizing rooms, pearl mosque, gem mosque, peacock throne, room of mirrors, bathing bowl and many more. ●Baby Taj - The mausoleum is a definite place to visit. The tomb is the exclusive piece of Mughal architecture but it hold a significant difference. It is much different from the period of Humayun’s and Akbar’s Mughal architectural type. The structure is very similar to Taj Mahal. It was built by Noor Jahan, wife of Jahangir, and is often referred to as Baby Taj. River Yamuna flows near the mausoleum. Though most of the carved works are damaged due to environmental factors but it is very famous for marble lattice screen. ●Mehtab Bagh - Moonlight Garden is one of the most romantic place. Taj Mahal on one side and river Yamuna on the other make the garden a dream paradise. It gives postcard perfect views suitable for a perfect click. Due to its ambience speciality, the location is popular among couples and families. People start to gather across the lawn as the sun starts to set. 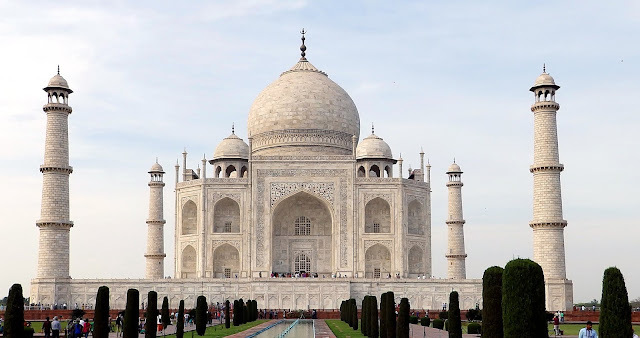 As per legends, Shahjahan wanted to build his mausoleum of black marble to mirror the Taj Mahal. But his son, Emperor Aurangzeb, ended up throwing him in prison. ●The Taj Walk - Enjoy a walk in the Taj Protected Forest, which is located just before reaching the East Gate. The walk is a mix of paved paths and dirt trails. You can also spot peacocks roaming wild. The crowning jewel of the park being the free views of the Taj Mahal! There are a few benches placed across the grounds and every once in a while you’ll come across unexpected hills that presents dazzling views of the Taj in the sunlight. As the park is located at the eastern side of Taj, you get the best views in the morning when the sunlight hits the mausoleum. Afternoon view will not be that bad, but the Taj will be backlit – something to keep in mind if you want to click some amazing photos. ●Get a brief idea regarding the place by reading various booklets. This will give you a brief idea regarding what to see and explore in Taj Mahal. ●The place opens at 6AM for the visitors. Enter through the east gate to watch and feel the purity of true love when the sun rays kisses the marble stones of the mausoleum. ●There are different entry gates. The nationals shall pay Rs. 20 per person and foreigners shall pay Rs. 750 per person. ●Make sure your stomach is full while visiting to the place. Noone is allowed to bring snacks or food inside the campus. ●The place is undoubtedly always beautiful at any season. But it is always better to choose winters as Agra gets hotter in summers. ●Western phase of Taj Mahal can create interesting photo frames. Be patient to take some really good snaps as it is always crowded with visitors. ●Lastly, you must visit during a full moon night. When you are inside it you can actually see the shimmer of the moonlight due to the pristine translucent marbles. Agra the abode of love has a lot of amazing things to explore and experience. The city preserves the tales of Indian history. It has its own charming essence that attracted Indian emperors to make it their capital, including Mughals. Their presence had left vibrant marks in the form of unique architecture, culture, taste and preference. Agra tour cannot be completed within a day. If you are planning a visit for a day then it is suggested you must not. Visiting and exploring this fine piece of Mughal architecture will definitely make a lifetime experience.